I start this by acknowledging that you, Dear Reader, might not like me much by the time you finish this. I need to go ahead and tell you that I am not suffering for Jesus like you might have thought. I’m certainly not suffering like I thought I might. When I first imagined living in Port-au-Prince, like full-time, every single day, I envisioned a small cinderblock home with Spartan furnishings, little and unpredictable at that electricity and maybe a small cookstove. I would be hot, uncomfortable and likely lose weight. One of three ain’t bad. I’m hot. But when I’m in my home on Delmas 75, I’m very comfortable. And the big secret I’m about to let you in on — her name is Paul Sinette — is one of many Haitians apparently determined that I not lose any weight. My first inkling that I would have someone cooking my meals came back in March. I was visiting Haiti to attend a conference and look for a place to live. The first property owner I spoke with told me I needed someone to cook and clean for me. I resisted this idea. I am coming her to serve, not to be served. Oh, I had so much to learn. It took many conversations, a lot of healthy mental gymnastics and education, but I settled on the idea of at least considering hiring someone. And eat. Manje anpil. Eat a lot. He quizzed me when he came home from work. He quizzed the people who were serving my meals. And when I didn’t put enough food on my plate when I was eating with him, he added more. His son Herns helped explain the desire to feed people when it’s possible. “Haitian people eat a lot when they can because they don’t always know if they’ll get to eat again soon,” he explained. It became a running joke, but thankfully I was a bit glad to be in charge of my own meals. Which were starkly American. And not that good. The first few weeks I wouldn’t use my cookstove, so I depended on sandwiches and salads. My first Haitian guests got ham and cheese sandwiches. They were not impressed. That’s when my landlady shared with me an idea about interviewing Paul Sinette. By this time, I knew the mutual benefits of hiring someone to help me. It provides an income for a family, it will help with my Creole (everyone tells me that if I eat Haitian food, I’ll speak more like a Haitian) and, the most startling reason of all — I can have all this for less than what I paid for my cable bill in the U.S.
She’s maybe 30 years old, has two children and goes to church at 6 a.m. on Sundays so she can spend the rest of the day helping me. 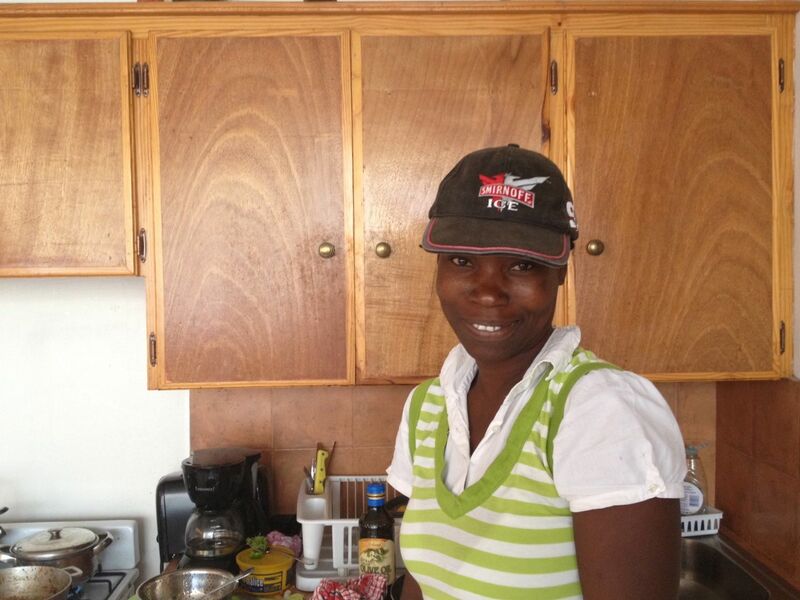 She’s funny, loves to help me learn Creole and, oh yeah, she’s a fabulous cook. While I’m writing this, I’m sipping on fresh squeezed orange juice. For lunch I had barbecued chicken, rice and beans with a tangy pepper and onion sauce, macaroni and cheese (yes, you read that correctly) and a huge fresh salad. She buys most of the fresh fruits and vegetables, along with vinegar, oils, rice, pasta and sugar, at the street market. But she also goes through my pantry to find those old standards I’ve collected. Saturday’s lunch included a fresh salad with spaghetti served with a delicious tuna salad. I could tell she disapproved of the tuna fish, but I think she just wanted to use it up. That was also the same day I reached for a Coke in the refrigerator and she calmly told me she was making fresh juice (that one was lemonade) and that I could have the Coke later …. I’m still adjusting to the routine, but I can tell you that when I’m traveling one of the best parts about home that I miss is Paul Sinette. And not just for her cooking. She wants me to succeed. She wants to learn her language. She wants me to appreciate the food and culture and life that is Haitian. And she is grateful that I’m here, and, I believe, not just because she has a job. I’m not sure how I feel about employing someone to work in my home. It still feels odd to me, off-kilter and strangely guilty. I, who came to serve am served, and I who eat so well, live very closely to people who might not eat much at all. The dichotomy jostles me, and I hope it always does. Haiti is known as a place where hungry people live, yet the food here is some of the most delicious in the world. Strangely enough, the Creole word for hungry is grangou. And the word for delicious is gou. But as recently as the 1970s, Haiti was able to feed itself, depending on the production of peasants in the countryside selling their goods. It was only after extended political corruption and greedy international trade agreements that the situation turned tragic. My work is with agricultural organizations hoping to reverse that trend and provide more food for everyone here. It’s ambitious work, but I know that many good people are ready for this challenge. This morning when Paul Sinette arrived with her trademark smile and “bonjou,” I asked if she’d already been to church. Among the rest of her prayers, I’m pretty sure she asked God to make sure I chose juice over Coke and to help me with my Creole. My prayer was simpler. I just thanked God for sending me her. I still catch myself wanting to be a savior. I know better, of course. I am in Haiti to work with farmer organizations, to share the stories of their work and to help advocate on their behalf. But getting started in the work is slow-going — my journeys out to meet with people from each group are spaced a few weeks apart, and my Creole still prohibits me from doing more of the planning myself. So I practice my new language by settling into my new life in Port-au-Prince, sharing time and meals with friends here and learning patience. At least try to learn patience. It’s not easy, because as I am just figuring out, I am SO American. I like to set goals and see results. I like to control at least some of the things that will happen in my day. At the very least, I’d like to know what might happen in my day. And this has not been the case. So in three months, when I thought I would be well settled into a routine and begin the real work of being here, I’m just becoming acquainted with this new me. And one of the toughest parts of that is realizing that my ego gets in the way of pretty much everything I try to do. I do not like that sinking feeling when I catch myself wanting to save somebody. I’m not talking about saving as in saving someone’s soul. If anything can show me just how naïve and unsophisticated my own spiritual faith, it’s spending time in a place like Haiti. I’m talking about “helping my neighbor” by giving them things. I’m on the verge of becoming that person I don’t like — you know, the one that when you just want to share your problems they want to “fix” everything. I don’t like that. And I don’t like this urge I have to “fix” stuff here. I come from an ordinary town in Virginia. We have pockets of poor and a social system that’s more or less segregated. People with wealth socialize with similar people, and the poor gather in different places. I was fortunate to feel comfortable with people from all walks, and mostly I spent time in the middle. It’s easy to do in America — zoning laws take care of that. Our governments carefully zone neighborhoods by how much money someone has. Big houses with lots of lawn on in one area, and tiny plots of land with small houses fill other areas. We invest many dollars in the streets of some parts of a city, and other areas come last. But in places like Haiti, though there are “better” neighborhoods and “slums”, you cannot avoid the poverty. For a place where most people live on less than $2 U.S. a day, a lot of people are selling them things. Markets crowd into the street, and many families make a little extra by buying candy, household items and food to sell to other people. These merchants are as poor as their customers. Children, some as young as 7 or 8, walk among the vehicles on busy thoroughfares carrying rags. They will swipe the rag across the windshield and hope the driver will hand them a few gourdes. I’ve started carrying small bills to hand out when I see them, but that doesn’t concern me. What bothers me is the way I feel when I hear their quiet thank yous. God didn’t send me here to hand out change. I think he sent me here to help make a change. And I need the patience to wait for that chance. There’s nothing wrong with handing out a few gourdes to hard working kids. I know myself well enough that I will keep doing that. What I need to change is my motivation for doing so. I cannot respond to the needs of the economically poor to enrich my spiritual poverty. I need to find that place in which I am with my brothers and sisters, sharing with them the good and the bad and together, finding God’s grace. This is a big task to accomplish in the singular glance between a child standing the heat with a dusty cloth and me in the comfort of a shiny vehicle. I want that child to see the face of someone who cares deeply about his circumstances, who wants to work toward a larger change that will mean he’s at him home being a kid, not working the dangerous streets to help feed his family. Only then can I honestly give him a small wage for his work and accept his thanks — not with pleasure at my giving, but with pleasure for our exchange. I am blessed to live here, and I am more blessed to work here. The work of my assigned mission will come, but until then, my work is in the day-to-day: Nurturing friendships with the people around me, accepting their gifts of openness, advice and companionship, sharing meals that I provide and those of my friends and learning everything I can about this place that God and I so love. And a part of that work is carefully discerning this new me that is being molded here, watching and listening for clues that I’m going off path. It’s a beautiful journey, though it’s sometimes hard. I’m not saving anyone in Haiti, but I can feel the saving grace I’m finding here. It’s beneath my wings. I am blessed, and I am glad you are here with me. 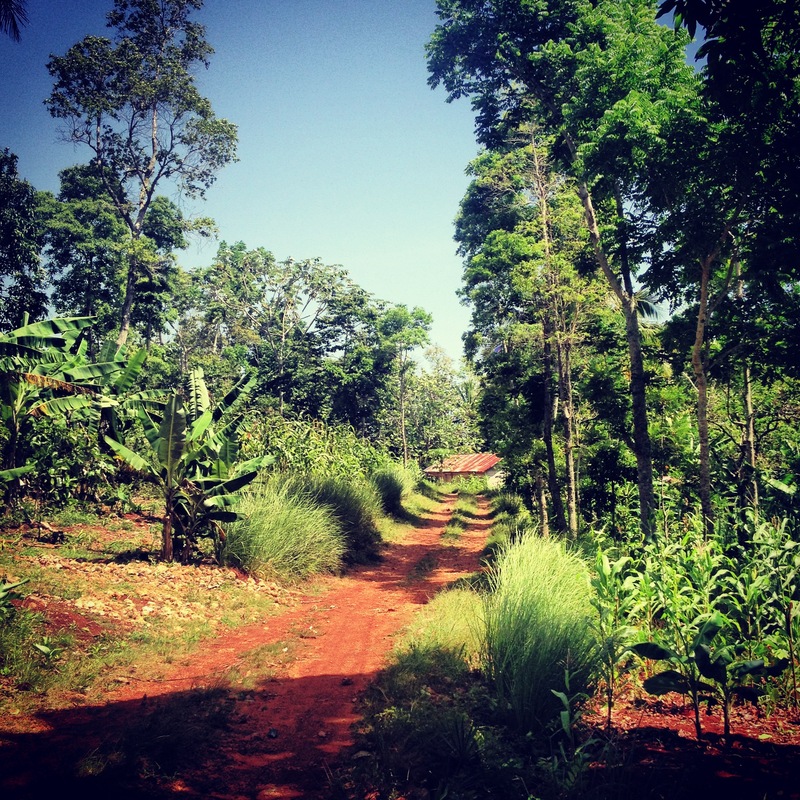 The pathways in Haiti always seem to lead me home. That’s what they each told me. As we walked down steep, narrow paths, filled with ruts and rocks of all sizes, I would flinch at the thought of slipping and falling. And they didn’t. And we walked for miles. And the hills were steep, and rain from the night before would have moved the rocks — both large and small — so I’d never know what was ahead of the next hill. The mud was slick, and piles of gravelly rocks were slippery. But neither Felix nor Herns nor Goursse let me fall. On August 11, Pe Goursse Celestin preached his last sermon as the officiant at St. Andre’s Episcopal Church, Cazale, before he would be transferred to St. Marc Church at Trouin. It was difficult to follow Pe Goursse’s message in Creole, but his first words resonated with me. “Ou pa bezwen pe,” he said. His sermon was on the story of Abram. Abram’s wife, Sarah, was old, yet they had no children. When God said you will have sons and daughters, they cannot believe that. Sarah is too old to have a child. God asked if they could count the stars in the skies, and they could not. “So shall your descendants be,” God said. And so it was that Abram believed. It didn’t take long on those walks in the Haitian countryside for me to believe. Even when I walked without the strong arms of a Celestin, I slowly gained confidence. Now, let me tell you something about these hills I climbed. Easily traversed by goats, in some places, they are little more than ruts in the hillsides. Rainwater has deepened the ruts into tiny crevices. Large rocks lay in the pathway, while even larger rocks jut out from its banks. Then when we go “off-path,” our feet sink into deep, muddy soil. Or we find ourselves in dry rock that is always either seemingly straight up or straight down. Since coming to Haiti in May, I’ve learned to find a place for my fears. I’ve learned this by trusting in the strength and kindness I’ve found in the people here, and I’ve learned this by learning — again — to trust in my faith. I will not fall. I am not afraid. And though I do not understand all of what Pe Goursse told his parishioners on Sunday, I believe he said that if we follow the paths laid out for us by our Father in Heaven, we shall not be afraid. Those strong arms always are with me. And, I believe, they are with you, too. A number of my friends have commented on the images of Haiti I show on my blog and Facebook. The beautiful vistas, rugged mountains that rise out of green valleys, stark trees against the bright horizon, sunrises and sunsets that astound with deep hues and — almost always — set behind a palm tree. Readers like the bright colors of clothing women wear on their way to and from market, and the images of the ample sacks of goods they carry on their heads. Or the strikingly beautiful smiles of small children just happy to have their photo taken. These are not the images seen on the news, friends say. These are the truth of Haiti. The rest of the story. And that is true, but just like the photos of poverty don’t show the whole truth, neither do these photos I capture. Like any other culture, unless you physically spend time among Haitians, you will not see the whole truth. And I know that I risk oversimplifying — or worse, sentimentalizing — the Haiti that I want you to know. I have a friend in Cherident who is an artist. His name is Felix Celestin. His work is beautiful — brightly colored images of rural life or of flowers or women. But recently, he showed me a new painting, one that made me cringe. As a piece of art, it’s effective. But its effectiveness conjures the emotions of that other part of Haiti — the part I don’t like to show. The part I’m just realizing I want to shield, even from myself. The painting is broken into thirds. On the left side, he shows the remnants of the 2010 earthquake, above it all is the fire in the Iron Market and the flowing floodwaters of a hurricane washes through the middle. I am afraid I upset Felix when I cringed. But it wasn’t only the image that affected me. It was the sudden realization that I am here to face the ugly truths as well. And to do my job, as my brothers and sisters both in Haiti and the U.S., I have to tell these “other” stories. Perhaps I’m worried that the images will be TOO stark, perhaps more painful that the truth, because even a photograph shows one quick glimpse of the whole story. More than likely, I’m worried if I snap these photos and show them without the full story I’ll be guilty of impressing only with painful emotions. I’m not sophisticated enough to tell you what I need to tell you with only pictures — or even words and pictures. Every day I realize how much more I need to know about this culture before I will understand it myself, so I’m a long way from explaining it all to you. If I call these people my brothers and sisters, as I do, I cannot risk diminishing their dignity through careless documentation. And at the same time, I cannot wait to share their stories. They are too important. So I will do my best here to use my words. The jagged edge of extreme poverty is all around me. In Port-au-Prince I see it in the faces of children who race from car to car in traffic, rag in hand, to wipe the ever-present dust off windshields. They’re working for handouts. When I first moved here, they were all boys, now I see young girls out there. It’s heartbreaking. But in the countryside, it’s even more apparent. I spent most of last week in the northern mountains. I went with Mark Hare, a mission co-worker with the Presbyterian Church (USA) who works as an agricultural technician. And as informal trainer for me. Mark has worked in Haiti for years with other ag technicians and local families who are building and maintaining yard gardens so they can produce food year-round. Where we would go, into the mountains above Verrettes, the conditions would be difficult, Mark explained. As it turns out, he might be the king of the understatement. The mountains were like nothing I’ve ever seen. The roads — or what passes for roads in rural, mountainous Haiti — tormented the Toyota LandCruiser. We made it up winding, gravely pathways on nothing short of a powerful 4-wheel drive system, an ambitious driver and the will of God. The farther we drove into the mountains, the more apparent was the harshness of life here. At the edge of the narrow roadways, children peeked out from behind trees to see what was causing the ruckus. Small children, some wearing few clothes, perched on the dusty banks or on clusters of large rocks. Some waved shyly or grinned, but most just stared. The further we got into the mountains, the rarer the sound and sight of a vehicle, so some children laughed to see us. The most startling image was that of about a dozen men carefully walking down the gravelly road as we climbed one of the steep hills on the way to Decomb. Six men walked behind the other six or eight who carried and old door above their shoulders. All I could see of the woman lying covered up on the door was a quick glimpse of her face and her hands gripping the wooden sides. Mark stopped the truck well away from the group, and we waited while they passed. Later, someone in our truck said it looked like the woman had cholera. He said he could tell by her face. And driving slowly along these rural roads, I saw the faces of those walking. I saw fatigue on their sweaty faces and dusty clothes. They have so far to walk. Their load is so heavy. And a strange and unrelenting guilt washes over me as I go by. At an intersection in Verrettes, a reasonably sized town, several members of a family sat on a concrete porch very close to the road. A toddler played with what looked like a Fisher-Price baby stroller. Except it wasn’t the whole toy stroller — it was one handle, connected to one red and yellow wheel. That was all. The boy grinned as he pushed the broken piece of a toy along the porch. There are so many other moments that startle me — and I hope they always will. This is a cruel land. I often catch myself confused by the feelings of joy of being here, of the blessings I find especially in juxtaposition with the cruelties of a developing nation and the vulnerable people trying to make it through another day. There is hope here. I have no doubt of that. And there is the hope in Christ here. On any given morning you will see someone carrying a Bible or hear a piece of Scripture in conversation. Felix told me the reason he painted the photo showing the disasters of Haiti. He is aware the image will take the audience aback. But he has to, he said, to honestly depict his country. I admire his tenacity to use his God-given talents to tell the story of Haiti. That earthquake — he was here. Those cyclones? He and his family have felt them and feared them. Like all our brothers and sisters here, he is well poised to tell those stories, and all I can do is listen and learn how to help. Bondye is in all of this, and I will do my best to tell the stories of when and where and how I see Him. But until I can do without diminishing the dignity of those I see and meet, I will not show you the images of where, at any given time, He is most needed.